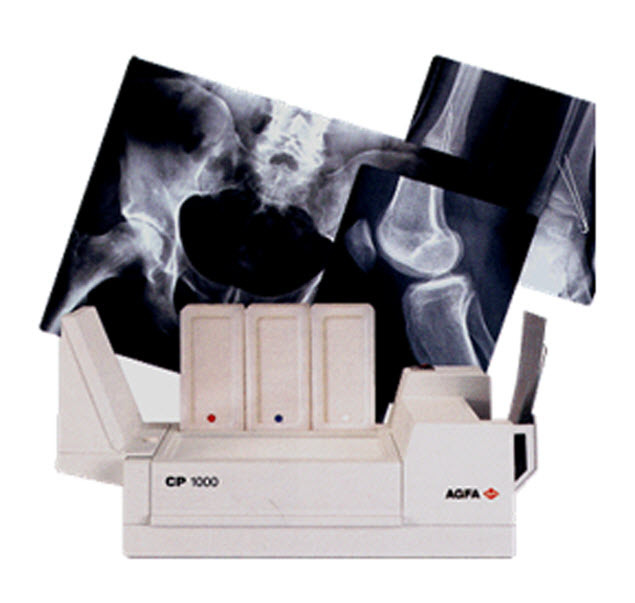 The Agfa CP1000 is an easy-to-use automatic film processor. Its compact size and light weight make do with installation costs. It has automatic temperature control and drying, produces no waste water and, above all it comes at the right price. Totally Self-Contained - Designed and built with the same reliability as our large, high-volume processors, the CP 1000 Processor is ideal for diagnostic offices, military field clinics, remote departments, and chiropractic and veterinary offices. It is also an excellent backup for your regular processor. The CP 1000 provides consistent, high-quality processing of film sizes ranging from 4" . 4" up to 14" . 36" for applications with moderate patient/film volume. Fast Processing - With its 125-second cycle time (leading edge into developer to leading edge at dryer), the CP 1000 provides quick access to finished radiographs. Energy Efficient - The CP 1000 operates on only 400 watts of power. Economical stand-by mode reduces power to 100 watts when the processor is idle. To further reduce power consumption, the processor may be turned off when not in active use, then, because of its fast warm-up time, quickly restarted. A Self-Contained Darkroom Processor - That Sets Up Anywhere and Requires No Plumbing. Plug it in, insert filled chemical and wash-water bottles, then start working fast, quiet; infrared dryer lowers energy costs. External replenishment kit - If you are a “larger” client, you can resort to the external replenishment kit to replace the set of 5 l replenisher bottles which sometimes appears to be insufficient. Using the external replenishment kit, you can connect the CP 1000 to bigger replenisher tanks. Required - 26" . 26"